White Barn Events, a Tulsa wedding venues, sees a lot of different action in the bridesmaid dress department. Bridesmaids dresses! Every bridesmaids’ potential nightmare. Will they be pretty? Will they be flattering? Or will the bride make her maids look like actual oompaloompas just so she shines even brighter on her big day?! Nah I don’t think that’s true. A true friend would never do that to her bridesmaids and of course would want every aspect of their wedding aka the bridesmaid’s dresses to be flawless. So what look should you go for? What are bridesmaids wearing these days? There are so many different looks and styles to choose from. We’ve seen it all from identical satin gowns to matching pink tutus. Here are some of the bridesmaid dress trends that we’ve recently seen at Tulsa wedding venues. 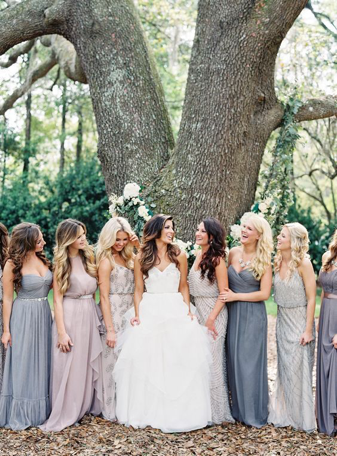 The classic bridesmaid dress look would be to have all of your bridesmaids wear the same dress. This is probably the most common and most classic style to choose from. Identical dresses make your wedding look uniform and perfect. This classic styling looks great at any Tulsa wedding venues, whether you choose to have your wedding ceremony outdoors, indoors, in a church, or in a barn. Though the classic look is beautiful, many brides these days are choosing to go a different route. 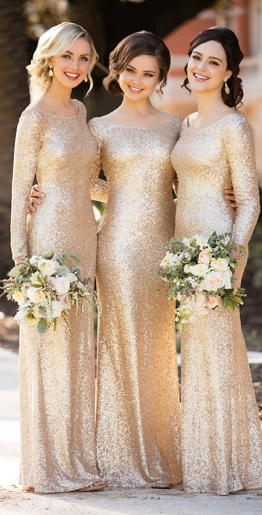 There are many different options you can have your bridesmaids wear in order to switch things up a bit. One of the ways you can do this is to have every bridesmaid wear a dress of the same length and color but have a different bodice. In this look, everything will look the same except for the top of each girls dress. Many dress stores have these different dress options and would love you help you find your perfect bridesmaid dresses. Check out this link at David’s Bridal that helps you find your perfect mismatched bridesmaid dresses. This option would have to be one of my favorites! 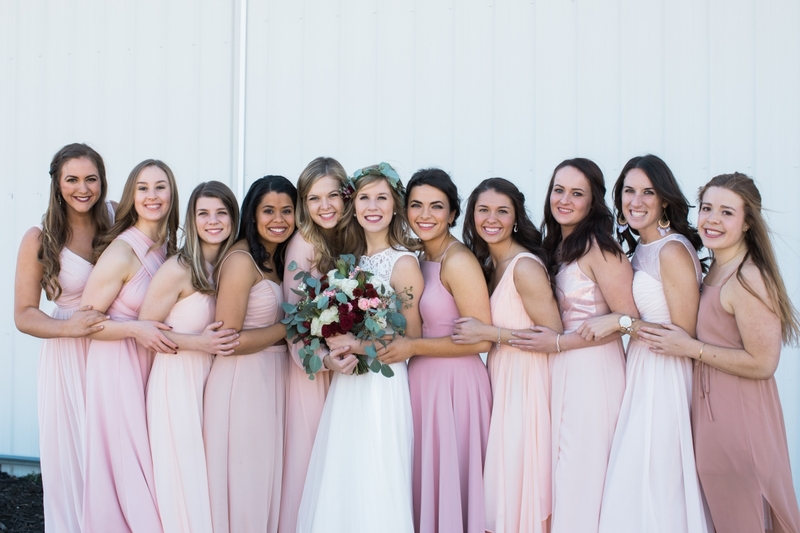 Once you have your color scheme down, you and your bridesmaids can choose different dresses and different colors that go along with this color scheme. You can choose different colors or variations of a color to achieve this new, trendy look. This is a style that you can have a lot of fun with! It can even be easier for the bride who can tell her bridesmaids the guidelines and they can go find the dress and colors that look the best on them. If they need help on figuring out what style looks best with their body type click here for advice. This way everyone is happy! So many styling options to choose from but don’t get stressed! Follow your heart about what styling suits your wedding the best. If you’re having trouble and don’t know where to start, check out this article on The Knot that walks you through the steps of how to find the perfect bridesmaid dresses for your wedding. No matter which styling you choose to go with, they all look great! At the end of the day its your wedding and it will be beautiful.